At the early November EICMA motorcycle show in Milan, Vespa pulled the wraps off a totally new style of Vespa - the Quarantasei (Italian for 46). The name is a reference to the year Piaggio began selling scooters (1946) and it’s also refers to how this scooters was based on the original 1945 MP6 Vespa design by Corradino D’Ascanio. It’s called 46 because it’s one step beyond the ’45 model. Perhaps the most exciting news for Vespa enthusiasts is that Piaggio has committed to getting this scooter in production by next fall. Since the Quarantasei is meant to be a re-interpretation of the MP6 style, it shares several styling elements including the suspended seat and wasp like tail. There’s also quite a bit of deviation from the MP6 design, such as moving the headlight from the front fender to the headset. The overall look is decidedly more edgy and aggressive then recent Vespas. 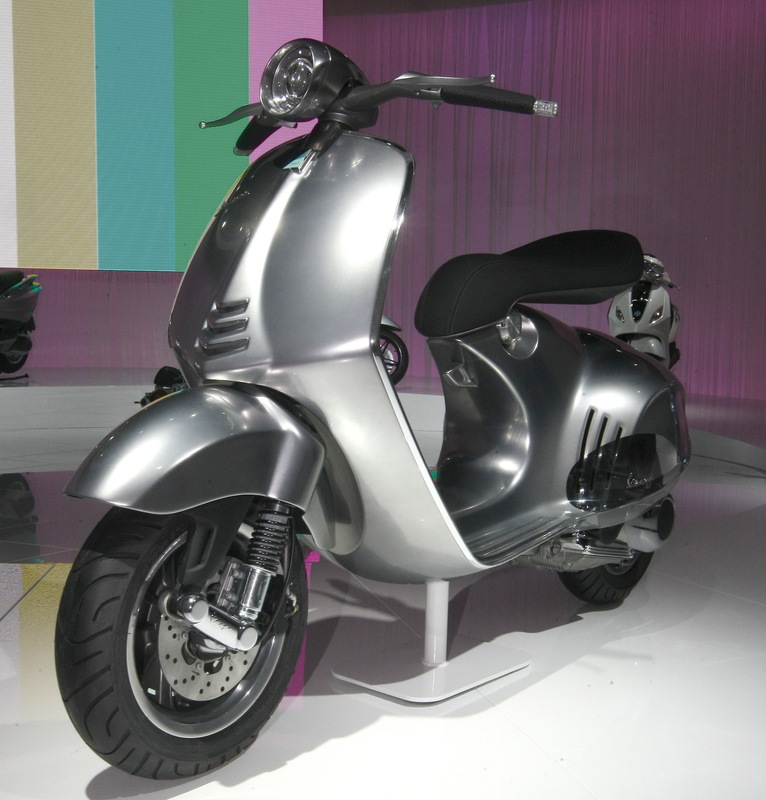 While parts of the design may not suit everyone, there is a lot to like with this new Vespa. The more aggressive and mature look will broaden the appeal of this scooter to folks who find the LX and GTS series of scooters a little too cheeky. The lighting execution on this concept scooter is excellent, with a modern projector beam headlight and the integrated circular LED taillight that surrounds the gas cap, although there’s likely to be changes before production starts. Other neat design touches from Vespa include running the cables inside the handlebar rather than externally, which really cleans up the handlebar area. Vespa also integrated the LED front blinkers into the ends of the handlebars, which is clever but likely doesn’t meet too many safety regulations. 3-valves, or maybe they just found a way to get similar performance at a lower cost. Production is slated to being in fall 2012 for the Quarantasei. Between now and then Vespa is going to be making changes to this design to meet safety regulations and tweak the style in a few areas. I personally would like to see the seat area re-worked a bit. The floating seat concept is nice, but I’d like to see it shortened and lowered a bit so it doesn’t stick out so much. The rear end of this scooter is a work of art and hopefully not too many changes are made here aside from the inclusion of a bracket to mount a licence plate. It’s also quite certain that the handlebar end LED blinkers are going to be gone on the production version. It’ll be interesting to watch this design develop over the coming year.